It’s that time of year, when you like to pay homage to the Founding Fathers. Reading aloud from the Bill of Rights. Thumbing your nose at England. Donning a powdered wig. And now, drinking their whiskey. 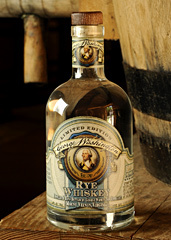 Presenting George Washington Rye Whiskey, available for sale at Mount Vernon beginning this Thursday at noon for the first time in 200 years. This is what Washington (the original George W.) would pour if he showed up on your rooftop Sunday night with a bucket of potato salad and a handful of sparklers. It’s his own recipe, in fact, as taken from his original records at Mount Vernon—and rediscovered when some enterprising archaeologists decided to rebuild his distillery a few years back (the Indiana Joneses of booze). You’ll want to head to Mount Vernon early enough on Thursday to wet your whistle with a gratis taste of the white whiskey, before grabbing one of the 500 bottles to uncork as you watch the fireworks this weekend. This stuff has been barely sipped since it was made late last year, but we have it on good authority that you can expect a slightly floral, earthy and grainy drink with a bit of bite. And you thought it would be cherry-infused.